The second of two chapters that tell the story of the 1901-02 season. In the final months of the campaign, Clarence Spooner announced that Home Park would host a series of matches to be played against professional league sides, a clear indication of his ambitions for Argyle FC. 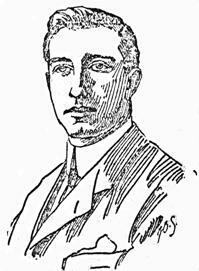 Sam Hollis, manager and Secretary of Bristol City, who in September 1901 promised every possible assistance to help bring professional League football to Plymouth, remained true to his word. He brought his team to the Rectory, Devonport on Wednesday 5th February 1902 to play Devon County. The only Argyle player taking part was Sid Wyatt at left-back. Devon had planned to play Buchan in goal but he was still under suspension. Bristol City had left the Southern League and were in their first season after joining the Football League Division Two. As an example of what could be achieved by a club in the West, Bristol City were competing against the likes of Newton Heath (Manchester United), West Bromwich Albion, Middlesbrough, Leicester Fosse, Preston North End and finished the season 6th in the League table. They formed only seven years before as Bristol South End, and five years before were in the Western League (formerly the Bristol & District League). A good crowd saw the professionals, who were very rough in play, defeat Devon 6-1. The next day, Bristol City travelled to Truro where they beat Cornwall 5-0. Argyle suffered a second defeat in the Devon League on the 8th February 1902 at Home Park, 3-1 against Crownhill. Argyle were leading 1-0 at half time but were upset in the second half following a penalty by Haynes. His spot-kick struck the Crownhill goalkeeper but rebounded back to him. As he was about to slot home his second chance the referee prohibited his effort because he ruled the penalty was taken twice. Ignorance of the Laws of the game was not confined to referees but also the players. In the Devon Wednesday League on 19th February, the game kicked off before the arrival of Argyle Wednesday’s goalkeeper Harold Pinsent; in his place fullback, John Pattison took up the position. During the first half, Pinsent arrived and went into goal without informing the referee. The moment he touched the ball the referee blew for 'hands' and awarded opponents, Y.M.C.A., a penalty. Fortunately, for Argyle Wednesday, they were still able to record their seventh win in seven League matches, 3-1. Argyle Reserves lost 4-0 to Oreston Rovers Reserves on the 15th February 1902 in the Devon Junior Cup 1st Round. They entered a protest, one of the many that bogged down the Devon F.A. throughout every season. On consideration, like the majority, it was dismissed. Local Football Clubs were undisciplined and unreliable. Petty disputes arose out of nothing. 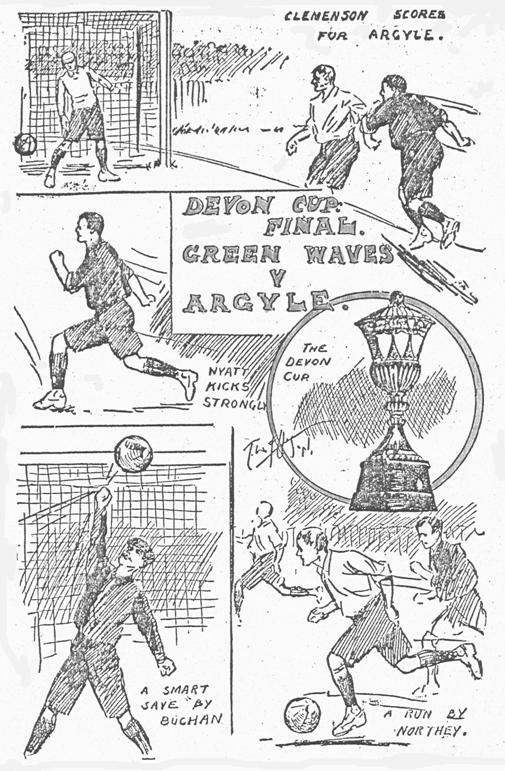 On Saturday 15th February 1902, Argyle had an arranged friendly fixture with archrivals Green Waves who failed to turn up without any given reason. The absence of consistency that professional League standards brought to the game meant that the South West was way behind the example of Bristol and beyond. George Jones, the Devon F.A. Senior Secretary, had begun visiting club meetings to give talks on the game, to encourage discussion and answer questions on the various laws. Unlike some of his County colleagues, he wanted change. George Jones had been involved with the Gloucestershire F.A. during the development of Bristol South End into Bristol City. He was instrumental in arranging the Devon versus Bristol City match. The local game in Devon and Cornwall was overdue a professional League Association football club set-up to raise the standard and further the game. Professionally run rugby clubs such as Albion and Plymouth R.F.C. had achieved these changes in that code and the public had embraced the progress. Would they do the same for Association football, was the Plymouth public ready to support a professional club? In October 1901, the Devon F.A. had offered the clubs in Exeter and district to manage their own Eastern League but under their jurisdiction. This was rejected on the grounds that the Devon F.A. was only interested in its Western districts and had no sympathy for the East. They wanted to run their own East Devon County F.A. area without interference and wanted to have increased representation on the parent Devon F.A. The Senior Secretary, George Jones, wrote to the Eastern representatives denying neglect and refusing their proposal. The Eastern discontent continued to fester until the Devon F.A. held a meeting on the 19th February 1902 at the Newmarket Hotel, Plymouth to meet the Exeter and district representatives. The meeting was large and well attended by the clubs from the East. Their chief speaker, Mr. Harvey of Exeter United, said the game was in a bad way in their area. This he put down to neglect by the Devon F.A. whose League competition was a farce. Their players were over-looked for County matches. Mr. Axworthy (Devon F.A. Treasurer) said that they had provided a cup for competition and held County trials at Newton Abbot and Plymouth. Mr. Bickle (County Secretary) added he had tried to set up the position for an Eastern District Secretary but nobody was prepared to accept the position. The Devon F.A. attributed the failure to flourish in the East as the fault of Exonians who were not prepared to do the work. The comments at the heated meeting were subject to applause and shouts of “hear, hear”. It was agreed at the end of the meeting that Devon F.A. officials would form a sub committee to draw up byelaws to govern the Eastern Competition. Since being formed in 1900 the Argyle Rugby Club 'Chiefs' had not lost a single match at Home Park, other than a practice match before this season started. Coming into their ‘home’ match with the Cornish champions, Redruth, on Saturday 25th January 1902 their Home Park record was Won: 18, Drawn: 2. On the day the Cornishmen were victorious 3 points to nil thus ending the seventeen-month record. It was only Argyle’s fifth defeat in 45 recorded Argyle matches. The only other defeat this season was versus Torquay Athletic, 14 points to 13, at Plainmoor. This was the Argyle Rugby Club’s third visit to the ground during 1901, whilst the Argyle (Association) Football Club had only played there once, versus Torquay Y.M.C.A., on the 26th December 1892. The Argyle Rugby Club Reserves, in a similar story to the Argyle Association Reserves this season, appear to have wound up after a heavy defeat on the 1st February 1902. They could only field ten players and subsequently were beaten by 50 points to nil against the R.N.E. College 3rd XV at Bladderly. This sudden disappearance of a heavily beaten team had been a regular occurrence in the local game in both codes from the earliest days. The capitulation of a team was not always the logical conclusion to a match, as at Home Park on Saturday 22nd February 1902. Argyle had a Devon League fixture with the 5th Provisional Battalion, a team of soldiers made up from the Forces stationed in the Garrison. The match kicked off in a heavy downpour of rain; the ground became a quagmire and the ball sodden. The conditions acted as a leveller, neither team being on top. There were few attacks until Broad was able to latch on to a free-kick to put Argyle 1-0 up. The leader of the 5th Provisional attack was the Reverend Frank Ford Hawkey, a Methodist Army & Navy Chaplain who had made a guest appearance for Argyle this season. Time after time he began initiating dangerous attacks on the Argyle goal though the home defence proved very strong. As half time approached twice the soldiers came close to equalising. The rain was still incessant as the whistle sounded with Argyle leading 1-0. The Western Daily Mercury continues the report – “So discomforting were the circumstances that the soldiers, who would have had the wind against them in the second half, preferred not to continue the game, and conceded the points to Argyle”. Soldiers refusing to go into battle! On the same day as the above match, and a week after their heavy Cup defeat against Oreston Reserves, the Argyle Reserves failed to show for a League match versus Athletic at Saltash, thus forfeiting the points. Captain and Secretary, Anson Crouch, wrote to the Devon F.A. explaining, four players were unable to turn out due to vaccinations and the rest refused to take their places. The incessant rain and wind was not given as the reason. Therefore, he could not send a team across the Tamar to Saltash. In addition to the loss of League points, the failure also cost Argyle a 10 shilling fine. Newspaper reports of the same day show that Green Waves fulfilled their fixture in Saltash versus Essa, and Defiance from Torpoint completed their fixture at Oreston. No other completed Argyle Reserves fixture has been found for the rest of the season. There was to be no further ‘Reserve’ team until Plymouth Argyle Reserves in 1903-04. In the Devon Wednesday League, on the 5th March 1902, at Turnchapel in fine weather, the ‘home’ team Y.M.C.A., after waiting, found they could not raise a team so conceded the points to Argyle Wednesday. Subsequently a friendly match was played, in which the Y.M.C.A. gave Argyle their hardest fought win of the season, 2-1. All season Argyle were in the top three places of the Devon League, as the fixtures turned to the Devon Senior Cup. They received a bye in the First Round and were drawn in the Second Round to play Essa on their Longstone, Saltash ground on the 1st March 1902. Unfortunately, Essa’s Reserve team had not paid a 10 shilling fine for non-fulfilment of a League fixture and they were registered jointly, under one fee, with the Essa 1st team to the Devon F.A. The County decided they should give Essa an ultimatum to pay up by Friday 28th February 1902 or they were suspended and their cup-tie with Argyle cancelled. On the day, Argyle and Essa arrived at Longstone for their Cup match, but the referee, Tom Pawley (that name again), failed to turn up. In the absence of an official referee, the two teams played a friendly match, which Argyle won 2-1. Essa had paid the fine because Mr. Pawley told the Devon F.A. he had missed his train and when he did arrive, a friendly was being played. The Cup tie was rescheduled to the 8th March 1902. Again, Argyle were thwarted, this time by King Edward VII. He was making an official visit to The Three Towns with Queen Alexandra, which caused the postponement of many sporting fixtures. The Essa match was rescheduled to the 15th March 1902 causing some inconvenience. ‘Argyle Notes’ in the Herald report “Once again we took the long and perilous journey to Saltash, this time the referee put in an appearance”. On the same day, Devon defeated Somerset 2-0 at Paulton with Percy Buchan in goal, so Argyle put Albert Ledington, normally a fullback, in goal for the Essa match. Devon did allow Wyatt to play for Argyle rather than Devon. Despite the absence of their Captain in goal, Argyle defeated Essa 4-2 to advance into the Semi-Final. George Jones (Devon Senior Secretary) was none too pleased with Mr. Pawley for causing the unfortunate delay. Neither would Argyle have been too pleased as the delay was compressing the rest of their season and their extensive plans. The re-arranged Cup match on the 15th caused the postponement of the League match versus Oreston Rovers. In the last five weeks of the season, the first team were to have fourteen crucial fixtures to fulfil, four of them against professional League clubs. Argyle’s players were amateurs who had busy working lives. To ease the burden and spread the load, a number of guest local players assisted Argyle in the friendly matches, but the pressure was to tell in the nine Cup and League matches. At a meeting of the Devon F.A. held at the Newmarket Hotel on the evening of Tuesday 18th March 1902, a letter received from Charles Bishop (Argyle F.C. Wednesday Secretary) was read to the meeting. His letter detailed a list of matches the Argyle Club had arranged with professional League clubs to be played at Home Park: Aston Villa (Football League Division 1) on 19th April; Crewe Alexandra (Midland League) on Good Friday, 28th March; and Woolwich Arsenal (Football League Division 2), date not given. These arrangements were a bit late and took the Devon F.A. by some surprise as they had been discussing since early March about bringing another professional League club to play Devon. Senior Secretary George Jones thought they should now cancel any further arrangements and back the Argyle programme. Argyle had yet to give the complete programme; the final match was going to interfere with other fixtures. At the same Devon County meeting on the 18th March 1902, the committee were read a letter from the Exeter Junior Association League stating that St. Sidwell’s had won the competition and they would like to know if the Devon F.A. could send the cup as quickly as possible. As a sub-committee was then formed to go into the matter, it seems the Devon F.A. had no cup, despite earlier assurances in February they would provide one. This was not going to help the already strained relationship with the Eastern clubs. The Exeter clubs, led by Exeter United, had met at the Exeter Guildhall at the beginning of March to discuss a proposal to arrange an exhibition match to be played in Exeter by two professional League clubs. A committee was formed and two clubs, Southampton and Aston Villa were approached. The Devon F.A. granted permission for the match to be played at the end of April and voted to support the Exeter match committee by donating the less than princely sum of £3 and 3 shillings. ‘Observer’ wrote in the Football Herald, Saturday 22nd March 1902 that to his “astonishment, and almost consternation, I find that the splendid list of fixtures arranged by the Home Park Club had not then been completed”. He had happened to run into Mr. Dawson Spooner last Wednesday who disclosed “the startling news” that Argyle had an additional fixture to “their sumptuous fare” on Saturday 26th April versus Nottingham Forest (Football League Division 1). Arrangements with Woolwich Arsenal had been completed and they were playing on the 25th with a 6.00 pm kick-off. Paying no attention to the Devon F.A., Argyle arranged the Forest match on the same day as the Devon Senior Cup Final. The Argyle Athletic Club Sports Executive, which included the experienced Jack Jaques, said they had arranged the matches, starting with the lighter opposition of Crewe Alexandra, to build in stages to the crescendo of the two consecutive day matches. They likened it to a feast of courses for “Association epicures”. Tickets for the Crewe match were priced at Ground: 6 old pence; Stand: 1 shilling, but could be obtained at a discount if booked early at 3 pence and 9 pence respectively. In all four matches, Argyle intended to field mostly their own players with a 'leavening' from other clubs. If there were any doubt in which direction the Argyle Football Club was intending to head, the impressive programme of matches answered them. Argyle were still unsure of the outcome so the club was not committing itself to professional football just yet. They had a distinct well thought out long-term plan, which included bringing more major clubs to Home Park next season. Argyle were being likened to Albion whose exploits initiated the rise of Devon Rugby. Argyle could do the same for Association football. Albion’s success was the reason for Argyle’s caution as well as encouragement. They were at the top of the Rugby tree in Great Britain, commanding crowds of up to 15,000 at The Rectory. Losing just one match in 1900-01, Albion brought out a book that, considering there was no organised Rugby Union competition, was ambiguously entitled 'Albion Football Team – HOLDERS OF THE WORLD RECORD FOR RUGBY FOOTBALL FOR FOOTBALL SEASON 1900-01', price 1 shilling. A few months back Albion were billing their forthcoming match with Bristol to 'decide the Club Championship of England'. This, of course, is unofficial, but it was not stretching the bounds of reality too far. On the same day that Argyle F.C. defeated Essa 4 - 2 at Saltash in the Devon Senior Cup, Albion had attracted another big crowd to The Rectory and defeated one of the best sides anywhere, Swansea, 10 points to 4. As if this was not reason enough for caution, the Plymouth R.F.C. were also going great guns; their crowds at South Devon Place were in the 5 – 7,000 range, and the R.N.E. College, Devonport were also very successful. The Devon County team had beaten the Rest of England 11 points to nil at Exeter as recently as the 4th January 1902. Because of this trial match, eight of the fifteen Devon players became England internationals. Local rugby rivals did not welcome the formation of the Argyle Rugby Football Club. Plymouth R.F.C. refused to sponsor their application to join the Devon Rugby Union. During the 1901-02 season, a dispute arose between the two clubs, which resulted in the Argyle Rugby Club being found guilty of 'unsportsmanlike behaviour' by the Devon R.U. Rivalry did not bring out the best in clubs. At one time Albion said if Plymouth R.F.C. wants to play us, it would have to be with our third string! The public were very disappointed that Albion and Plymouth R.F.C. would not arrange fixtures against each other. Private individuals offered to supply a Cup to be competed for, though the R.F.U. would not have approved it. The reason why the League in Devon was so poorly run can be explained by moves being made at this time. There were complaints that the same four or five individuals had the total control of all matters related to Devon Association football. Allegations of a bias in favour of Argyle were made; the Cup Final date was changed because of the professional matches. At the Devon F.A. meeting on Monday 24th March 1902, George Jones, who had experience with the Gloucestershire F.A. agreed matters needed improving. He said Devon and Cornwall were the only two remaining counties where the County Executive ran the League. The County Executive had a very heavy workload and Mr. Jones said this was the cause of the dissatisfaction felt by clubs, including other districts (Exeter). He proposed that the management of the Leagues be put in the hands of the clubs. Mr. John Dawson Spooner, representing Argyle, thought it an excellent idea. Charles Bishop (Argyle Wednesday) proposed the scheme should be accepted and it was seconded to go ahead for further discussion. In beautiful weather, on Good Friday 28th March 1902, around 7,000 to 8,000 were attracted to Home Park to witness the first match in the professional programme. Crewe Alexandra had been original members of the Football League Division 2 in the 1892-93 season. After finishing bottom in two consecutive seasons, they were not re-elected for 1896-97 and now played in the Midland League. Four guests, Jack Coaker (Defiance), William Hisbent (Green Waves), Archie Wheaton (Crownhill), and George Northey (Green Waves), bolstered the Argyle line-up. Argyle started the match in fine style, stringing together good passes that put Crewe under pressure and kept their goalkeeper busy, punching the ball out. Argyle’s Scillonian-born Theo Stideford shot at the Crewe goal and the ball was sent whizzing along the roof of the net. Crewe’s attempts to attack were speedily repulsed. The crowd exhaled a great burst of disappointment as William Cleminson, with the goal at his mercy, shot over the bar. Within a minute Argyle were punished for the miss as a quick Crewe attack resulted in Buchan being beaten. Though Crewe were leading 1-0, play remained even. Percy Buchan, a good cricketer, often threw the ball out to players, rather than kicked. He could throw as far as the half way line if required. He threw out to Northey who dribbled to the Crewe goal but missed an easy chance to score. The interval arrived, 1-0 to Crewe. The second half started at a fast pace. Both sides attacked one after the other with Crewe showing some pretty passes in the goalmouth but their shots went astray, not testing Buchan. The visitors were on top but their poor shooting encouraged Argyle to fight their way back into the match. Now having matters switched their way; after a long spell of attacking, Argyle’s outside-left John G. Scarr scored a soft goal to even the score. Splendid play came from both sides. On numerous occasions, Argyle came within an ace of going ahead. The home side were showing prettier and more stylish play than their professional opponents. Twice, just before the final whistle, the Crewe goalkeeper had to save warm shots. The referee blew with the score 1-1 and Argyle still attacking. In amongst the excitement of the professional matches, it was almost forgotten that Argyle were still in a position to win the League and Cup. The Argyle Wednesday team had won the Devon Wednesday League with matches in hand, and finished by winning all their twelve matches, though two were by teams conceding. In their final match versus Edgecumbe, they did not bother with a goalkeeper in the second half, but still won 6-0. Argyle’s Saturday and Wednesday team players were registered separately. Therefore, any registered Argyle player in one of the teams, whose occupation allowed, could be an opponent, if registered with another club, on the other day. The Flanaghan brothers, registered with Argyle Wednesday, were registered on Saturdays for Oreston Rovers. The next day, after the Crewe match, Argyle had a doubly crucial match versus Oreston Rovers, who fielded the two Flanaghans. To help reduce the number of matches, or at least fit them all in, this match was agreed to be played as a Devon Senior Cup Semi-final and for the Devon League Division One points. As a Cup Semi-final the match was played on a neutral ground at Thanckes, Torpoint, though as a League fixture it was Argyle’s ‘Home’ match. The ground, being next to the Tamar, allowed Oreston to travel by chartered boat, referred to in the Press as a 'P & O Liner' (it was one of the Plymouth & Oreston ferries). Seven of the Argyle players lining-up had played in the Crewe match only twenty-four hours before. Despite their recent exertions, the Argyle players were able to match Oreston in a terrifically fast-paced game on a pitch swept by a very high wind. Percy Buchan kept Oreston at bay with many fine saves. Oreston scored first but Argyle scored twice to lead 2-1 at the break. In the second half Argyle, with the slope in their favour did most of the pressing and scored four more goals to win 6-1. At 4-1, the referee sent off one of the Oreston players for swearing and the game became poor. In great disorder, the referee sent off another Oreston player, Charlie Flanaghan, for violently pushing another player, and the rest of the team walked off with him two minutes before time. Argyle were through to the Final of the Senior Cup and had bagged two League points in the process. In the other Cup Semi-final at Home Park, Green Waves knocked out the holders Royal Artillery 3-1. Oreston Rovers put in a protest over the Argyle result alleging incompetence of the referee. The referee, Sergeant Major Thompson, complained neither team protected him from the howling mob that followed him from the ground. At the hearing, an undignified wrangle broke out but the Devon F.A. dismissed the case. Oreston were reprimanded and both of the sent off players were suspended for a week. Though the Aston Villa match was still two weeks away, Argyle had already selected a provisional team who were undergoing a thorough course of training at Home Park, three nights a week. The team were disadvantaged in that they were from more than one local club. To aid their combination a trial match was played at Home Park on the 9th April against a Launceston XI. With nine registered Argyle players, but no Buchan in goal, and two guests, Argyle lost 4-3. Tickets for the Aston Villa match were already on sale, priced at Ground: 6 old pence: Stand: 1 shilling and six pence. CLARENCE SPOONER MAKING PLANS TO CHANGE THE DEVON F.A. There were very important developments going on off the pitch too. On Wednesday 2nd April 1902, the Devon F.A. continued the adjourned meeting that was setting up reforms to run the League competitions. Clarence Spooner attended to make sure any new agreements would not hinder Argyle’s development. Club representatives were going to manage the Leagues themselves. Fred Axworthy (Devon Treasurer) drew up the new laws for discussion but the clubs attending said they were the old rules. Mr. Axworthy said the rules differed because players and officials would administer them now. 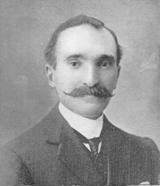 Clarence Spooner led the opposition saying they were not changes unless the member clubs were able to vote for their own Devon F.A. Chairman and Secretary. He did not want neutral gentlemen. Spooner made this a proposal and Sergeant Hollick (Royal Garrison Artillery) seconded it. The motion was adopted. The Devon F.A. attempted to keep the Annual General Meeting to a low profile by announcing its date verbally. Clarence Spooner would have none of it saying it was “most unbusinesslike”; the Devon F.A. was forced to post notice to all club members. The meeting terminated in uproar. Clarence Spooner working with Sergeant Hollick of the R.G.A. was no accident. They both had a man in mind to be the new Devon County Chairman, to take over from the ineffectual Herbert B. Spencer who rarely attended from Tavistock. That man was Lieutenant Frederick Hugh Windrum of the R.G.A. His previous experience and influence was crucial to Spooner and Argyle’s future plans. In boisterous weather at Oreston on Saturday 5th April 1902, a large crowd attended to see the fight for top spot in the Devon League Division One. Argyle went ahead 1-0, then after being penned in their half, Cleminson dribbled the whole length of the pitch to make it 2-0. His magnificent run was accompanied by great excitement from the Argyle supporters. In the second half, the attacking play was still mostly by Green Waves but, against the run of play, Cleminson scored again, 3-0. With the game in their hands, Argyle became dominant and the fourth goal was rushed through during a melee in the Green Waves goal area. Cleminson claiming a hat-trick. Argyle’s cohesive team play was described as brilliant in its intelligence and decisive swift moves. This was an emphatic victory for Argyle who went into top spot on goal difference, but the League title was still to be won. This was the day of the first Ibrox disaster in Glasgow. The writer of the match report in the Western Independent (6-4-1902) heads his account 'ARGYLE LEAGUE CHAMPIONS'. The Independent says it was a famous victory that has, at last, enabled Argyle to realise their ambition to secure the League championship, whilst crushing the same hope of Green Waves. Incredibly, the same premature mistake as last season had been made; Argyle’s dominance of Association football off the pitch led to an assumed inevitable result on it. Tavistock prevented Argyle claiming the League title last season and 1901-02 was to prove a similar ending. Clarence Spooner as Argyle’s mentor was its greatest asset. His absence from Plymouth social history denies him the recognition he deserves. Whilst he had power derived from wealth, he used it to raise standards and modernise the local game. He was never a pompous dictator and conducted himself as an enthusiast and lover of the Association game. He sought to guide and influence for the good of the game and to encourage all persons to partake in it, whatever class. Late-Victorian business had eventually recognised that a healthy and happy work force was a better work force. Leisure time was as important as time at work. The Spooner family and their pioneering, innovative Spooner & Co. business were the perfect examples of Victorian philanthropy. Clarence Spooner was an extraordinary man who went beyond this. He was not on a quest for personal glory, his scope and vision was for the good of all. His energetic drive hid a gentle shyness and humility. Despite his firm hold of Argyle, he did not set himself above or apart. He attended the club rooms regularly, enjoyed billiards and represented the Argyle Athletic Club in matches against other clubs. At this time, as the Spooner & Co. Senior Partner, he was Plymouth’s most prominent businessman; his marriage in 1897 to Edith Rose Pethick, daughter of John Pethick, the major Builder/Contractor, brought the two leading Plymouth commercial families together. Both family businesses were riding a very prosperous boom period in Plymouth. The Western Independent had called Argyle 'Mr. Spooner’s side', and that they were. The membership of the Argyle Athletic Club was not financing professional ambition; it was from the money made by the Spooner and Co. department store, via the family owners. Clarence Spooner was actively involved in the business at its head; he was a dynamic personality and a stickler for every little detail. He was busy running the Argyle Athletic Club Limited and Spooner & Co., concurrently, two expanding businesses, yet took time out to take charge of the Argyle Football Club training. Clarence’s sidekick was his older brother, John Dawson Spooner, a man of leisure; sport helped fill his hours. In the Spooner family tradition, sport was a large part of his life. He was involved in many various local sports events and meetings. Without the business worries of his more serious brother Clarence, 'J. D.' was laid back in comparison. In the 1901 Census, he is described as 'Retired Draper' at the age of 33, and on the Argyle Athletic Club Limited share list his occupation is listed as 'Gentleman'. He was a bachelor who could follow his whim and fancy. From 1892 to 1894, he was a Devon County F.A. referee. ‘J. D.’ was a fearless early owner of a motorbike, in 1903 competing in races on the dangerous Home Park banked track. On the day the King was visiting Plymouth, the 8th March 1902, he decided to make up the numbers for the short-handed Argyle Rugby Football Club in their match versus Paignton, making a one off appearance as a forward. He also played Cricket for the Argyle Cricket Club, in one match taking six wickets. MR. SPOONER’S MEN ELECTED OFFICIALS AT THE DEVON F.A. The Football Herald reported that the Devon F.A. Annual General Meeting at the Newmarket Hotel on the evening of Friday 11th April 1902, “has been awaited with more than ordinary interest, and it was no surprise to find a large attendance of club representatives. During the week meetings of the senior and junior clubs had been held and their representative chairmen and secretaries had been elected, these officials being the club’s representatives on the County Committee for the first time”. The large hall was filled to over-flowing. From the representatives who were now going to takeover the running of the League, the clubs had the power to nominate two from each division to represent their interests on the County Executive Committee. Clarence Spooner (Argyle) attempted to take control of the meeting from the beginning. He wanted the new rules agreed first and officers elected after. The old Executive tried to prevent new rules being voted on but were scuppered by the overwhelming club desire for reform. Spooner influenced the power change from the Executive to the clubs. The Devon F.A. Executive would be composed of three men, County Chairman, Secretary, and Treasurer, whilst the clubs would provide a Chairman and Secretary from the three Leagues - Senior, Junior, and Eastern (six men). If the Wednesday League were formed, it would be eight men. The meeting turned to the election of officers, starting with the Chairman of the Devon County Football Association. Clarence Spooner, with due haste to replace Herbert Spencer, proposed Lieutenant Windrum R. A., “a gentleman interested in the game, having been connected with Association football at Portsmouth”. After Mr. Spooner had assured the meeting that Lieutenant Windrum was in the district for some considerable time, his proposal was seconded and carried. Mr. Spooner had achieved his first goal. In acknowledgement of Fred Axworthy’s past friendship to Argyle, Clarence Spooner recommended and proposed his re-election as County Treasurer, which was also carried. This was surprising because on questioning, the Treasurer had no idea of the current financial state of affairs and admitted, as the season was drawing to a close, only Argyle and two other clubs had paid their match (referee) fees for 1901-02. Coming to light during this meeting was just how incompetent the Devon F.A. Executive had been, acting in the interests only of their own small inner sanctum. As more revelations became known, they started to turn on each other. Mr. Spooner attempted to make former Devon Secretary and Argyle Athletic Club member, Sampson Caddy, the new County Secretary but failed as Charles William Bickle was voted back into the position. Mr. Bickle, known for his anti-Argyle feelings, chided Clarence Spooner that the rumoured great alterations had not taken place. He was right to some extent; Devon was too conservative and the clubs suspicious of one another to effect radical change but Clarence Spooner was probably happy at the end of the meeting. This was a momentous meeting for Devon Association football in ending the archaic mishmash of the past and it heralded a proper accountable management that succeeded in bringing organised Association football to all parts of Devon within a very short time. George Jones, the only progressive and unbiased member of the old Executive with any competent ability, rightly retained his post as Senior League Secretary. Also a knowledgeable referee he understood the game from all angles and became a major influence on the game in Devon and Cornwall. Argyle gained a narrow 1-0 victory over Defiance in the League on the 12th April 1902 but other results moved them down to second in the table. The fast moving conveyor belt of matches brought the next to be played, the Devon Senior Cup Final at the Rectory versus Green Waves on Wednesday 16th April 1902. This was the re-arranged date resulting from Argyle’s clashing fixture with Nottingham Forest on the original date. The Final was to have been played at Home Park, which Argyle had offered to the Devon F.A. free of charge before they had reached the Final, but Green Waves objected to playing on Argyle’s ‘home’ ground. The last result Argyle needed was a draw, bearing in mind how many fixtures they had in April; unfortunately for them they got one. The team were at full strength for the match, the players staying remarkably free from injury after so many fixtures. An attendance of 5,000 saw Argyle, in their familiar Green and Black halved shirts, take the lead, the goal scored after twenty minutes by their on-form striker William Cleminson. Green Waves scrambled an equaliser just before half time. The match remained 1-1 to the end. The Devon F.A. had to arrange a replay on the few remaining dates before the closed season. Some of the Executive did not want another midweek match and were fed up catering for Argyle. They tried to fix it for the 26th April 1902, the same day as the Nottingham Forest fixture. George Jones, always the voice of reason, said they had given their word to assist Argyle in their professional engagements. He proposed a replay on the 23rd April and it was carried. Argyle Football Club 1 – 1 Green Waves. Attention now turned to, for many the main match of Argyle’s important season, the visit of prestigious Aston Villa. The famous formidable club had finished their Football League, Division One season on April 12th 1902, in eighth place behind Nottingham Forest who finished fifth. Villa were undertaking an arduous tour of fourteen matches in seventeen days beginning at Cardiff on the 14th, Aberdare 15th, Bristol 16th, Dorchester 17th, Argyle 19th, Yeovil 21st and another eight matches around England. For the match at Home Park the railway companies were running cheap excursions from Penzance, Exeter and Launceston. To increase the Home Park capacity the encircling track was roped off from the pitch to allow extra spectators. 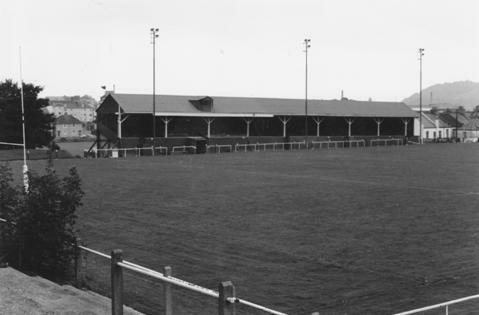 On the 17th, Aston Villa defeated Dorset 4-2 at Dorchester before a crowd of 2,000. Argyle’s unsettled and changing line-up ended up on match day to be six Argyle registered players plus five guests: Jack Coaker (Defiance), George Northey (Green Waves), Gunner L. Hawkins (Defiance / Royal Artillery), Walter Bennetts (Penzance) and William H. Shearer (Defiance). With four of the five players coming from Cornish clubs and excursion trains travelling from Penzance and Launceston, Argyle seemed to be trying to encourage an additional Cornwall fan base. Long before the 4 o’clock kick-off, the ground was full. The terraced south-west corner was well packed, while a complete row of seats lined the top of the cycle track inside the rails. More were squeezed in, to reach a 12,000 attendance. The pitch was in good condition despite being the venue for so many Association and Rugby matches throughout the season. Five minutes before the start, Villa followed out Mr. Carter the referee who checked out both goal nets. The home side were cheered onto the pitch as Argyle took the Milehouse goal. James McLuckie, a future Plymouth Argyle player, kicked off for Aston Villa. The opening play was described in the Football Herald as “the professional team fooling the home halves in a laughable way”. The Argyle XI, containing guests, had lost the team cohesion evident throughout the season; possibly the players were spooked by such a large crowd. Aston Villa were taking things very easy, too easy it seems because they allowed Scarr to score. The visitors claimed offside and the referee agreed. It was not long before McLuckie weaved through the Argyle defence and around Buchan who had rushed out to meet him; 1-0 to Villa. Then it was 2-0. The match became embarrassing. The ease with which Villa were passing the ball around and the helplessness of the home side was causing “plenty of laughter from the crowd”. As the goals went in the report says the forwards danced around with the ball, puzzling the homesters beyond measure and “the visitors wasted no energy in running”. By half time it was 6-0. The match became no more than an exhibition. Argyle had lost some of their nervousness in the latter stages of the half as Villa eased off. It must have been very uncomfortable for the crowd sitting on the hard-banked track; they came down onto the pitch during the lengthy interval to walk about and get some feeling back into their legs. The spectators vacated the pitch for the second half. The match resumed and it was not long before the Villa forwards “stood still and passed almost disdainfully”. Argyle came into the play more, or at least their opponents allowed them to. The score was only added to by one more tame goal. The eighth goal was threatened, but it did not come. At this point, those uncomfortably sat on the cycle track began to get up and walk about, some left the match. All serious play was over. The Football Herald says, “The end of the game was really welcome”. Looking on the bright side the Western Daily Mercury indicated the match must have been a financial success and served as an educational lesson. The Western Evening Herald said, “The ground and its surroundings presented a brilliant spectacle”. After the match, Clarence Spooner entertained both teams and officials, with a few friends, to a capital spread at the Albion Hotel, Millbay Road, Plymouth. The Secretary of Aston Villa thanked Clarence Spooner for the “handsome style” in which they had been kept during their visit, this being more luxurious than their normal experiences. The Villa 'boys' drank to the health of Clarence Spooner. On Sunday, the Aston Villa party were taken on an outing around Dartmoor, and treated to luncheon, again by the Argyle President. In their busy tour schedule of daily matches, Aston Villa took three days out for their Spooner special treat; a very generous host. It has to be assumed that a successful levelheaded businessperson such as Clarence Spooner would not waste money. He was looking ahead, gaining influential friends that could help future plans mature. Exeter was making final preparations for its professional League club exhibition match at the County Ground on the 26th April 1902 between West Bromwich Albion and Woolwich Arsenal. Both clubs were from Football League Division Two of which West Brom were 1901-02 champions and Arsenal had finished fourth. The Londoners were at Home Park to meet Argyle on the 25th. The match committee met at the Red Lion, St. Sidwell’s to make the final arrangements. The kick-off was fixed for 3.15 pm and would be preceded by the Champions of the Exeter & District Junior League, St. Sidwell’s, playing against a team made up from the rest of the League. Argyle’s hectic season returned to the Cup to try again to decide who the Devon Senior Cup Winners were. A fine crowd turned up for the replay, again at the Rectory, on Wednesday 23rd April 1902. The match kicked off at 5.30 in good weather despite a strong breeze. Argyle were more or less at full strength, only Clifton Pethick was missing, George B. Bryan, physics and mathematics instructor at the Royal Naval Engineers College, Devonport, replaced him. Argyle were hindered in the first half by the sun in their eyes. Cleminson was seeing stars as he was knocked out, causing a long delay as he recovered. Another collision involving Argyle’s Sid Wyatt and former Argyle player Alfred Shaw caused them to need attention. Green Waves were on top but Argyle’s reliable custodian, Percy Buchan, kept Green Waves at bay. George Northey, who had recently played on trial in the Southern League for Southampton, tried to put the Green Waves ahead with long shots without success. Argyle started the second half still without the combination that they showed in the 4-0 drubbing they gave Green Waves in the League. Each side seemed to fear the other and no headway was made. Not wanting another fixture, a tired Argyle tried hard in the final minutes to score the winner without avail. 0-0. Argyle’s previous opponents Aston Villa were perhaps also feeling the strain; still on tour and playing the eighth match in ten days they were defeated 2-0 by Southern League’s West Ham United at Canning Town. On Friday 25th April 1902, Woolwich Arsenal were scheduled to arrive in Plymouth at 4 o’clock in the afternoon at Millbay Station. Like Aston Villa, their headquarters was the Albion Hotel, close to the station. Unlike the other three professional matches, this match was not at Home Park. The kick-off at 6.00 pm, within two hours of Arsenal’s arrival, was at the Rectory. The venue and time of kick-off was specially arranged to enable dockyard workers to patronise the match (i.e. attempting to convert Albion and R.N.E. College rugby supporters). The ruse did not work, there were barely a 1,000 spectators in the ground at the start. Argyle fielded six of their own registered players, though only four were regular first team players, and the other five were guests from Devon and Cornwall clubs. In the Arsenal side was outside-left Wattie Anderson. A year later, he signed for Plymouth Argyle and tragically, lost his life as a direct result of playing in their first 1903-04 season. Argyle F.C. played Woolwich Arsenal at the ground on Friday 25th April 1902, instead of Home Park, to attract dockyard workers to their matches. The grandstand, though refurbished, probably dates from the original, built by Albion in 1896. Anderson soon made his mark on this match for Arsenal. Shortly after kick-off, he sent across a ripping centre that was turned into the goal, easily beating Buchan. The Argyle forwards “showing any amount of go” pressurised to equalise with the opposing keeper having to turn away on-target attempts. Play was full of life and Argyle were equal to their opponents. Phillips of Argyle gave away a penalty, which, unusually, the Arsenal goalkeeper took. He messed up the kick and Buchan was able to kick away. With the visitors still transfixed by the failure, Argyle took the ball the length of the pitch but Cleminson headed wide. The Arsenal goalkeeper was the busiest player on the pitch as he thwarted effort after effort until he was beaten by an unstoppable shot from Haynes. The score remained 1-1 to half time. There were now 2,000 spectators at the Rectory to witness the second half. Argyle began the half on the attack; Haynes hit the side netting with a shot. Argyle’s Hugh Phillips, the same player who signed for Crownhill after an enjoyable evening, again fouled an opponent, this time it was a free-kick. From the kick, another player helped the ball into the net. 2-1 to Woolwich Arsenal. This goal changed the match. “The Arsenal Forwards did what they liked after this,” reported the Western Daily Mercury. A long shot from Anderson “went over the houses”, though soon after, Buchan was beaten by a “daisy cutter” to make it 3-1. Percy Buchan delighted the crowd with more saves but the County custodian could not prevent a fourth from the “Reds”. It ended 4-1, but the final score could have been worse. On the next day, Saturday 26th April 1902, was the last of the speciality matches, a 3.15 kick-off at Home Park. It was potentially the most difficult, being against the highest finishers in the League. Nottingham Forest had seven international players in their line-up against Argyle and the local Press expected another object lesson to be taught to the local players. 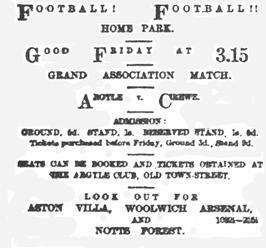 Forest were paying Argyle the compliment of travelling a distance for just this match; it was not part of a moneymaking tour à la Aston Villa, or two match Woolwich Arsenal. The match was said to have been the best of the bunch because full-strength Forest took the locals seriously and did not indulge in “fancy work and trick play”. This also accounted for the 10-1 final score. The Western Daily Mercury said the goals were “straight, hard, honest goals; not the sly, clever, tricky goals of Aston Villa”. The big loss was not put down to a helpless Argyle; they were praised for a much better performance than the scoreline suggests. They showed pluck and some skill. Argyle lined up with six of their own registered players, four of whom had played less than 24 hours ago against Woolwich Arsenal. As several guests from Green Waves did not take their places, Argyle were forced to make late changes. The five guests who played, two from Devon clubs and three from Cornish clubs, spread the involvement and interest of the observing West Country public. On a cold blustery day, the crowd was a less than an expected 5,000. Inside-left Arthur Morris, a Wales international, scored the first goal for Forest, and scored six in total. Argyle were playing well but stood off instead of marking their man closer. This gave the professionals time to pass and increase the score to 3-0. Argyle did not lose heart and fine play by the forwards resulted in Cleminson rushing the ball through to reduce the deficit to 3-1, amidst high crowd enthusiasm. Play was not all one way despite the 6-1 score line at half time. The second half started with Argyle forcing a save from the Forest keeper followed by a header from Archie Wheaton (Crownhill) that went just over the bar. Argyle’s right-half George Bryan, playing against his hometown club, set the forwards up for another attack but the move ended as Haynes injured his foot. He went off leaving Argyle a man down. Despite the disadvantage, they still attacked; Thompson (Royal Garrison Artillery) put the ball in the net for Argyle from an indirect free-kick, so the score remained 6-1. Eventually being a man down against such a side as Forest told as four more goals were added to the final 10-1 result. Whilst Argyle played Forest, in Exeter 3,000 to 4,000 were at the County Ground to see the exhibition game between West Bromwich Albion and Woolwich Arsenal, who had travelled up from Plymouth. As an exhibition match, the teams delivered as promised but the disappointed crowd were not served a serious match. Neither team played hard for victory; therefore it was surprising that W.B.A. won 1-0. When the ball did crash into the net, the crowd shouted themselves hoarse. The attendance receipts were not enough to cover the heavy expense. Before the exhibition match, St. Sidwell’s, as winners of the Exeter & District Junior League in 1901-02, played a match against the 'Rest'. The club lost 1-0 to the Combined League. St. Sidwell’s became Exeter City in 1904, who turned professional in 1908. With hardly any time to catch a breath, Argyle still had to decide the destiny of the Cup and League titles. All Association matches had to be completed before the close season, 1st May. Green Waves who pulled out their men from the Argyle team meeting Nottingham Forest had exhibited less than gentlemanly behaviour. It was a predatory move to take advantage of a tired Argyle, who also suffered the blow of losing Haynes, injured in the Forest match. A large and enthusiastic crowd attended the Devon Senior Cup Final 2nd Replay at the Rectory on Monday 28th April 1902. Immediately after the 5.15 kick-off it was obvious which side was in better condition; Green Waves were much more fit for action than their opponents were. The intense struggle of the previous matches between the two had gone; Joseph Hisbent had no difficulty beating Buchan to put Green Waves in front. Their supporters, now confident of the outcome, dealt out “good-natured banter”. Argyle had lost their sting. The Green Waves second goal came when the normally reliable Percy Buchan, in attempting to clear, threw the ball at a Green Waves forward who breasted it into the net. This was Buchan’s fourth match in five days. In the second half, the score became 3-0. Argyle lost heart. With twenty minutes to go, they pulled themselves together and scrambled a goal, 3-1. Until the end, play was brighter as Argyle tried their best but could not break down the defence of Green Waves. The silver cup was presented to the victorious captain, George Northey, who asked the crowd to give three cheers for Argyle. The dejected losers had reached the Final three times in the last four seasons without success. The cup that had eluded Argyle was borne out of the ground by the triumphant, excited supporters, players and officials of Green Waves. Devon League Division One published on 29-4-1902, the final 1901-02 table except for Oreston v Argyle, played on 30th. Statistically incorrect: table is missing one match in P (Played) and L (Lost) column. Goals F (For) total = 277 should be equal to Goals A (Against) total = 276. The Argyle record is correct. It is not known if the Devon F.A. later deliberated on the six unplayed matches. Then there was one. The final match in Argyle’s busy 1901-02 season was that on Wednesday 30th April 1902, Devon League Division One, Oreston Rovers versus Argyle, at Oreston. Green Waves, whose fixtures were completed, had one hand on the cup as leaders of the division with 27 points. A win for Argyle, in second place on 25 points, with their superior goal difference, meant the title was theirs. All they had to do was grab a win against mid table Oreston Rovers who Argyle defeated 6-1 a month earlier. Haynes returned from injury and the team was back to full strength. The match kicked off in the evening before a good crowd. Play started sensationally as fullback Albert Ledington failed to clear an Oreston attack by missing his kick. Before the other fullback, Sid Wyatt, could rescue the situation, Fred Lillicrap had put the ball past Buchan. Argyle, woken up by the reverse, attacked and a shot hit the Oreston upright. After more Argyle pressure, Oreston came back at the pretenders to the title and won a penalty. Buchan saved. Argyle forced play into the opponents half and a shot from Clifton Pethick struck the upright again. The half ended with Rovers attacking, 1-0 ahead. In the second half Argyle started to make more errors which Oreston capitalised on and they scrambled a second goal. The Rovers, with the hill in their favour, increased the pressure. Charlie Flanaghan, who was sent off in the last match between the two clubs, centred for his brother Robert (who was also registered with Argyle Wednesday) to screw number three into the net. Oreston continued to send in shot after shot with Buchan defending all attempts to score a fourth. Some relief was given by a rare Argyle foray from which Chas Lee scored for Argyle. Oreston resumed the attack and Buchan kept out more shots until Lillicrap scored his second. The 4 – 1 defeat was the biggest shock of the season. 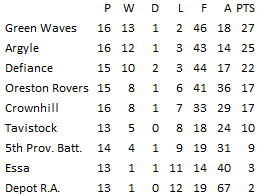 Green Waves had now won both competitions; Argyle had lost both. It seemed a long time since The Western Independent had wrongly declared Argyle as League Champions on the 6th April.